This easy to make chilli anchovy pasta is gutsy, adaptable and will be ready and on the table in 15 minutes, making it the perfect mid week comfort food, ideal for after a busy day at work. This is one of my favourite recipes – if you love the big strong flavours of anchovies, garlic, chilli and capers than I hope you will love it too. I’ve been making this dish at least twice a month for all my adult life, and first blogged about it way back in March 2007! I reckon that I have made this chilli anchovy pasta at least 250 times as it is so easy and I enjoy it so much. This combination is one of my favourite ways to serve spaghetti, I adore anchovies, intense and salty, they melt to make a simple, but oh-so-delicious sauce for the pasta. As well as being prefect for after work, it is also is the ideal dish after an unexpected evening out, quick and simple to prepare, and far better for you than grabbing a snack on the way home. This chili anchovy pasta ticks all my fuss free boxes and is the perfect midweek after work meal. It is ADAPTABLE – the core dish uses anchovies, garlic and chilli – but you can also add capers, tomato, olives and/or avocado. You can also use any pasta you have, or use a mixture to use up the ends of a few packets. Thanks to the big strong flavours it is DELICIOUS and SATISFYING. 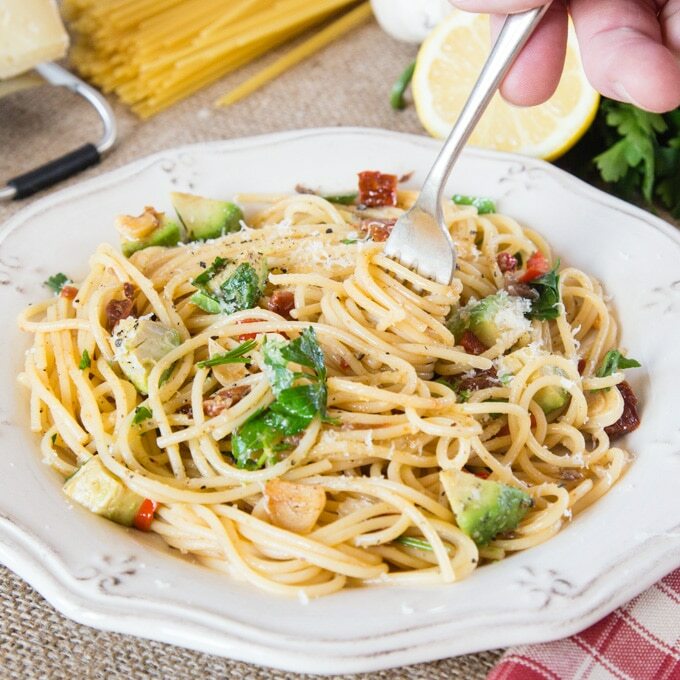 It is EASY TO ADD SOME VEGETABLES for that all important portion of extra veg – see my tips for easily adding vegetables to pasta dishes. Italian style fast food at its finest! The secret to this pasta dish is the way that the anchovies melt to make a sauce. I buy the small 2oz / 50g cans of anchovies in olive oil and always have several tins in my pantry. Simply open and tip anchovies and oil into a frying pan and gently heat, nudging the anchovies around the pan and they will slowly disintegrate, melting into the olive oil. It is a useful kitchen trick and one you will use again and again as a base for all sorts of sauces. 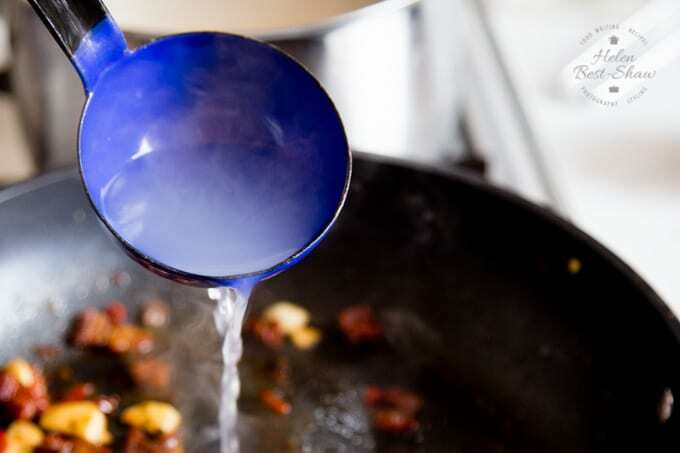 Step One – Heat some salted water in your largest pan, which will give the pasta some room to move as it cooks – cook as per the packet instructions. Step Two – Plonk the anchovies into the pan, and cook as described above until they have “melted”, add the sliced garlic, chilli and capers, sun dried tomatoes etc. Step Three – pour a splash of the pasta cooking water into the anchovy mixture. The starch adds a silkiness to the sauce and helps it to coat the pasta. Get into the habit of doing this every time you cook pasta – it is a simple trick which makes all the difference. Step Four – Strain the pasta and give it a good shake, tip it out of the strainer on top of the anchovy mixture. Add the chopped herbs, avocado (if using) and grated cheese and stir well. Serve and enjoy immediately. Always use a large pan to cook the pasta in, and add plenty of salt to the cooking water. Mix up the recipe – you can add capers, sun dried tomatoes, sliced pitted olives to the sauce. When chopping hot chillis wrap your fingers in cling film. You can use either red or green chillis. If you have leftover chillis slice them thinly and pop them in an airtight tub in the freezer. Scoop a few out and chop, then fry from frozen – no need to buy ready chopped jarred chillies preserved in vinegar. Mix up the herbs – or leave them out. The type of pasta doesn’t matter – use shapes, spaghetti or mix it all up. For more easy and speedy after work pasta you might like my Greek salad pasta, spicy garlic chicken pasta or my dinner party worthy, but still very easy beetroot pasta with scallops. If you try this Quick & Easy Chilli Anchovy Pasta please tag #FussFreeFlavours on Instagram or Twitter. It is amazing for me when for me when you make one of my recipes and I really do love to see them. You can also share it on my Facebook page. Please pin this recipe to Pinterest too! Thanks for reading Fuss Free Flavours! 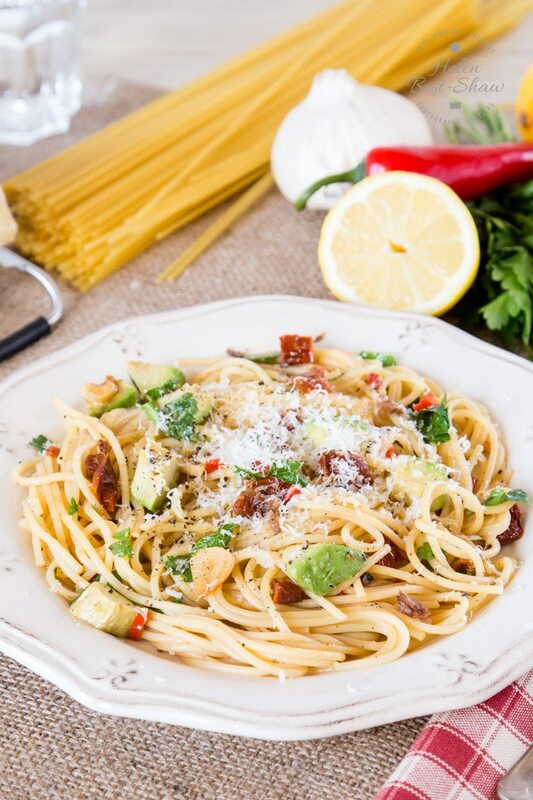 A speedy pasta flavoured with garlic, anchovy, chilli. Adaptable with endless variations. 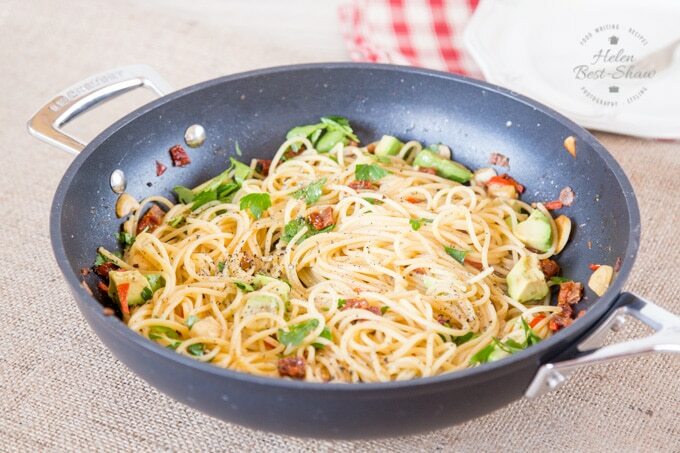 This easy pasta dish can be on the table in less than 15 minutes making it perfect for midweek meals. 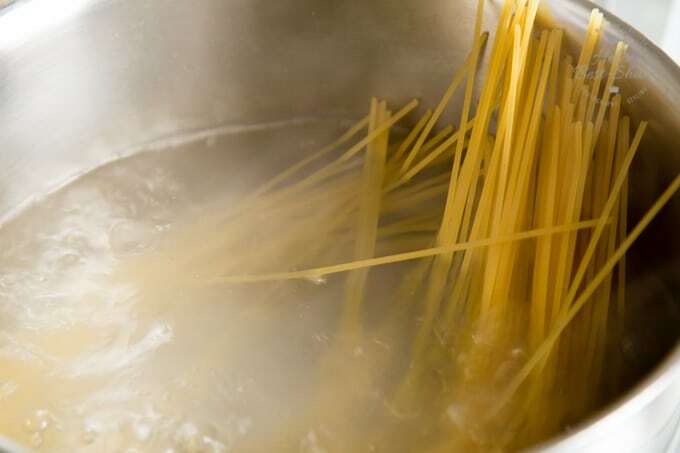 Place the spaghetti in a large pan of boiling salted water and cook according to the package instructions. Whilst the pasta is cooking open the anchovies and pour them into a large frying pan, cook over a low heat stirring all the time, until the anchovies "melt" and make a sauce. Add the garlic, chilli, and the capers, sun dried tomatoes and olives (if using). Cook for a few minutes. Once the pasta is cooked reserve a cup of cooking water and add a splash to the anchovy mixture. Drain the pasta and give it a good shake. 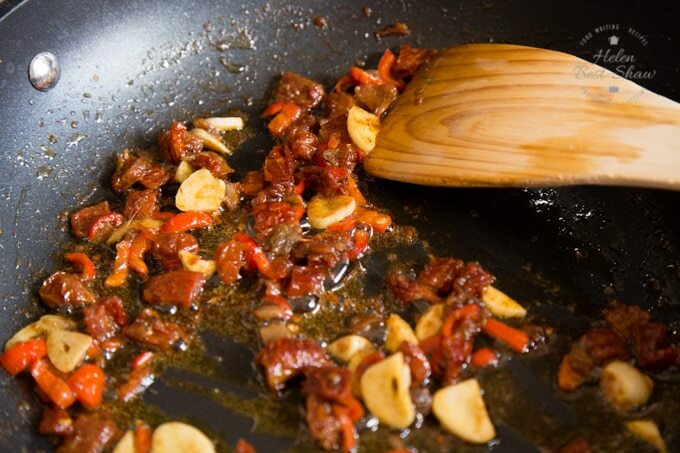 Add the the frying pan and stir well so it is coated with the anchovy sauce. Stir through the avocado (if using), Parmesan and chopped parsley and serve immediately. Mix up the recipe - you can add capers, sun dried tomatoes, sliced pitted olives to the sauce. 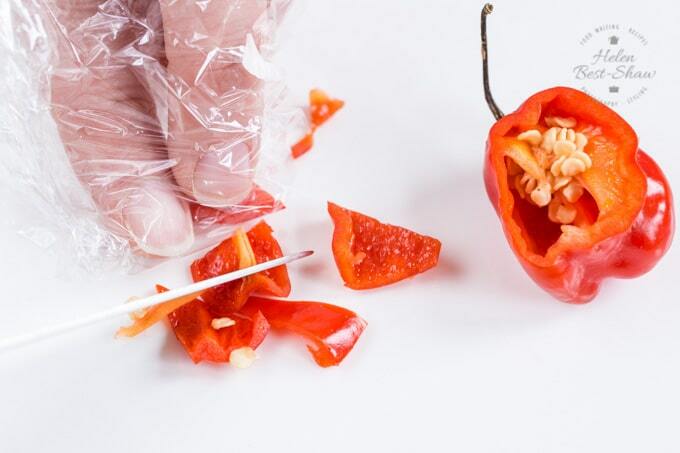 If you have leftover chillis slice them thinly and pop them in an airtight tub in the freezer. Scoop a few out and chop, then fry from frozen - no need to buy ready chopped jarred chillies preserved in vinegar. Mix up the herbs - or leave them out. The type of pasta doesn't matter - use shapes, spaghetti or mix it all up. Get a portion of vegetables into this dish by serving with a salad, or add a handful of greens to the pasta for the last 2 minutes of cooking time.